The last pair of West Indies held their nerve in the final over vs. Pakistan and tied the game that looked like being out of their reach, with 15 runs to win. The Green Shirts scored 229 with four wickets in hand at the end of the stipulated 50th over and the Caribbeans also managed 229 runs for the loss of 9 wickets in the required quota of overs. Misbah-ul-Haq (Pakistan) and Lendl Simmons (West Indies) were declared ‘Players of the match’ for their tremendous batting. The third One Day International of the five match series was played on Friday, July 19, 2013, at Beausejour Stadium, Gros Islet, St Lucia. Earlier, Dwayne Bravo, the captain of West Indies, won the toss and invited Pakistan to bat first. The regular opening pair of the visitors, Ahmed Shehzad along with Nasir Jamshed, started the innings slowly by scoring 23 runs in 10 overs with 3 fours. 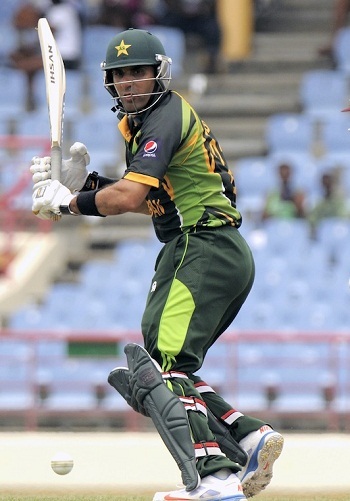 The partnership was broken at 39 when the first was gone for 17 and Nasir Jamshed departed at the same total for 20. Mohammad Hafeez and his skipper Misbah-ul-Haq tried to consolidate the innings and crawled to 70 after 23 overs when the latter hit the first six of the match in the next one. The second wicket fell at 92 as Mohammad Hafeez was caught by Darren Sammy at square leg off Dwayne Bravo for 14. 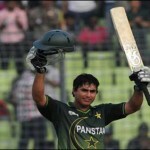 The debutant, Haris Sohail, walked in next and Misbah-ul-Haq dispatched his 27th ODI fifty in the 37th over. They shared a partnership of 60 runs for the fourth wicket while Haris Sohail lost his wicket for 26 runs. Umar Akmal took guards next and tried to raise the run rate with Misbah-ul-Haq who was later clean bowled by Dwayne Bravo for 75 off 112 balls with 2 lofty sixes and 3 fours. Umar Akmal hit 3 back to back fours in the 47th over off Bravo and remained unbeaten for 40 from 31 with 6 fours as Pakistan smashed 6-229 in 50 overs. Jason Holder and Dwayne Bravo were the main wicket takers with two wickets each whereas Kemar Roach and Darren Sammy held one wicket each. The Windies had a bad start when their openers, Chris Gayle and Johnson Charles, were sent back to the pavilion at 16 in 3.5 overs. Darren Bravo and Marlon Samuels stopped the invasion of the Green Shirt bowlers and reached 32 after 10 overs. Bravo was caught by Mohammad Hafeez off Wahab Riaz for 50 at his personal feat of 17 and was replaced by Lendl Simmons who opened his account with a four. Samuels kept on assisting well at the other side and the batsmen added 11 runs in the 27th over off Shahid Afridi with 1 six and 1 four. The total went past the hundred runs mark in the 29th over and the duo was unable to score any boundary in the coming six overs. Lendl Simmons attained his 12th ODI half century in the 37th over by punishing Wahab Riaz for 12 runs in the 37th over with 1 six and even four. The association was dismantled at 141 in 38.1 overs as Marlon Samuels was caught behind by Umar Akmal off Mohammad Irfan for 46 from 106 deliveries with 4 fours. Simmons took over and sent the ball out of fence regularly before he was caught smartly by Ahmed Shehzad at deep midwicket off Saeed Ajmal for 75 scored from 86 comprising 2 big sixes and 7 fours. The hosts lost their 8th wicket at 191 in 47 overs and they still required 39 runs to win the game in 18 balls. Sunil Narine hit 1 six and 2 fours on the first four deliveries of the next over off Saeed Ajmal and the bowler uprooted his stumps on the fifth ball. Jason Holder got together with Kemar Roach and they accumulated 9 runs in the 49th over but the home team still needed 15 runs to win from six deliveries. Misbah-ul-Haq handed over the ball to Wahab Riaz and Jason Holder treated him badly by hitting 1 six and 1 four and tied the match by getting two runs on the last ball. He secured his end for 19 off just 9 as the Caribbeans powered 9-229 runs in 50 overs. Junaid Khan and Saeed Ajmal were the supreme bowlers with three wickets each, Mohmammad Irfan got two whereas Wahab Riaz got one wicket for 63 runs. The third ODI ended up in a tie, the series is levelled at 1-1 and the fourth game will be held on July 22, 2013, at the same venue.